Anyone who knows even a little about economic development realizes that a downtown represents what is interpreted as the city or town’s window to the world… anywhere. The hustle and bustle, cleanliness and visual appeal of the downtown is the lasting impression people from outside communities absorb. Very few people who visit a town or city for a day or night out, infrequently see other parts of the community, so the downtown is in fact the community’s image. When it comes to economic development the epicenter of the discussion in Lowell, Massachusetts is indeed the downtown. Lowell is a place that has a lot of advantages that many other communities don’t have. The Tsongas Arena, Lowell Memorial Auditorium, regionally known festivals, a national park to name a few. 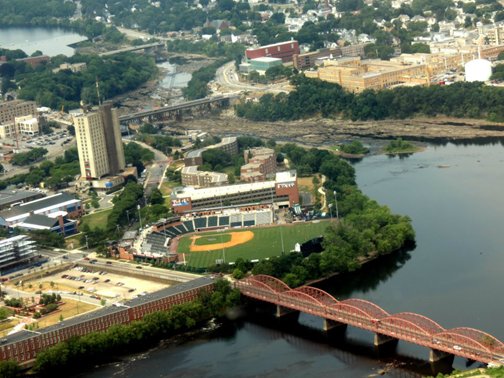 Lowell is home to UMass Lowell, which is now providing the region with a NCAA Division 1 sports scene. So the obvious question is why downtown Lowell appears to be in somewhat of a decline with closing businesses? It’s a question that the new Mayor of Lowell Rodney Elliott and newly elected City Councilor Corey Belanger, Chairman of the Economic Development subcommittee are asking and seek to solve. When then candidate for Lowell City Council Corey Belanger was running for office, he asked dozens of businesses downtown what was the main reason the downtown seemed to struggle? The overwhelming response to that question was the location of Lowell High School, which is planted in the heart of Lowell’s downtown district. Businesses owner’s claim to Belanger was that Lowell High School was a major contributor to traffic congestions two times a day. The other comment was when the high school emptied at the end of the day, students really didn’t have a disposable income to make a positive financial impact on business owners, which is needed to make a sustainable business in the downtown area. The message… if you’re going to clog our city streets with traffic and students, then it better be positive! Others made the assertion that although rents seemed reasonable, the location of the High School combined with a high business tax rate was the reason businesses opened and quickly closed. Councilor Rodney Elliott also has seen a pattern in the downtown that makes him concerned and has been expressing his views weekly at Lowell City Council for years on his concerns of the downtown. As Mayor, Elliott has now taken the bull by the horns and appointed Councilor Belanger to mount an economic development campaign centered on discussion and action, to turn the fortunes of Lowell’s downtown around. “We have enough 20 year plans in this city! We need to do something now! Businesses need help!” has been the frequent words of Councilor Belanger. Owner of his own downtown business, Belanger see’s the effects and lack of immediate action on a daily basis. Sure, Lowell has an organization called the Lowell Plan that was charged with focusing on economic development for the last twenty years. The Lowell Plan has been at the forefront of major studies for the long term plans of Lowell’s downtown. The Lowell Plan has made an important impact in many instances, but for some of those businesses downtown, they feel they need immediate help and additional voices at the forefront of these economic issues. In a recent radio broadcast on 980AM WCAP, radio personality and downtown business owner Teddy Panos held the radio stations first Economic Development Forum. A panel made up of well-known business people from Lowell and key developers, were featured in a discussion on downtown Lowell. The panel expressed their opinions on the key to the downtown’s success for the next fifty years. The overwhelming majority of the panel focused on two issues. One was the business tax rate and the other, moving Lowell High School from downtown. Finally, a serious discussion will take place with what this writer hopes will be with many voices rather than a selected few. Something needs to change in downtown Lowell. The contribution of voices, both pro and con to the fate of Lowell High School’s location and the business tax rate will be critical moving forward in a positive manner. A good friend and mentor, who knows a thing or two about economic development frequently said to me through the years… People eat with their eyes and consume what they see. Perhaps it’s time for some to work on issues that’s in front of them, rather than what’s projected to take place twenty years from now. John MacDonald is the President/CEO of Big Decisions, LLC, which is a management consulting business that concentrates on offering strategic advice on Marketing, Public Relations, Economic/ Business Development and Social Media. John has a long career of success, achieving record results in the communications field and spending over 20 years managing marketing budgets, driving the bottom line in the financial services, restaurant, retail and real estate industries. The Sandbox Foundation, is doing a whole lot of good things, to promote Economic Development in both Lowell and Lawrence. It is a great organization that sees the same vision as you do. Google them, and connect! Hand in Hand, you could work together.